Advanced Fuel Research, Inc. - On-Line Technologies, Inc.
FT-IR based gas analysis instruments, originally developed at Advanced Fuel Research, Inc. (AFR) and its first spin-off company, On-Line Technologies, Inc. (OLT), are now being sold by the MKS Instruments On-Line Products Group. AFR customizes and re-sells the MKS On-Line gas analysis products, primarily for combustion monitoring applications. 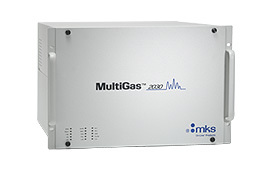 Series 2030 MultiGas™ Analyzer - Continuous Gas Analysis - Designed for fast, continuous monitoring of multiple gas species, the MultiGas 2030 is ideal for use in a variety of applications, such as PFC stack monitoring, ambient air analysis (industrial hygiene) and bulk gas analysis. The MultiGas 2030 features ppb level sensitivity for many gas species, a corrosion resistant gas cell which enables % to ppb detection without a gas cell change, and a user-friendly software design which enables simple calibration and operation. In addition, the ability of the MultiGas 2030 to store permanent gas calibration spectra removes the cost and need for gas cylinder use. Induct™ FTIR Gas Sensors - These are compact FTIR sensors that can be easily integrated into any process for fault, monitoring, control or end point determination. Process Sense Chamber Clean Endpoint Detector - A small low-cost particle-pressure analyzers specifically designed to determine the completion of plasma chamber cleaning for both semiconductor and flat panel deposition chambers. The U.S. Air Force's recognition of AFR's MultiGas Analysis capabilities. The U.S. Department of Energy recognition of AFR's Fourier Transform Infrared Products. For additional information on these products, visit MKS On-Line Products™ website at: http://www.mksinst.com or contact Advanced Fuel Research, Inc.